Allison knows I'm a foodie. She was kind enough to pack our weekend with trips to her favorite eateries, including Toscanini's, which had some of the richest and most unique ice cream I've ever tasted. I read in a tour book that Boston has some of the best ice cream in America. Despite the fact that I'm lactose intolerant, I love ice cream. Allison said she knew the perfect place, and she was right. 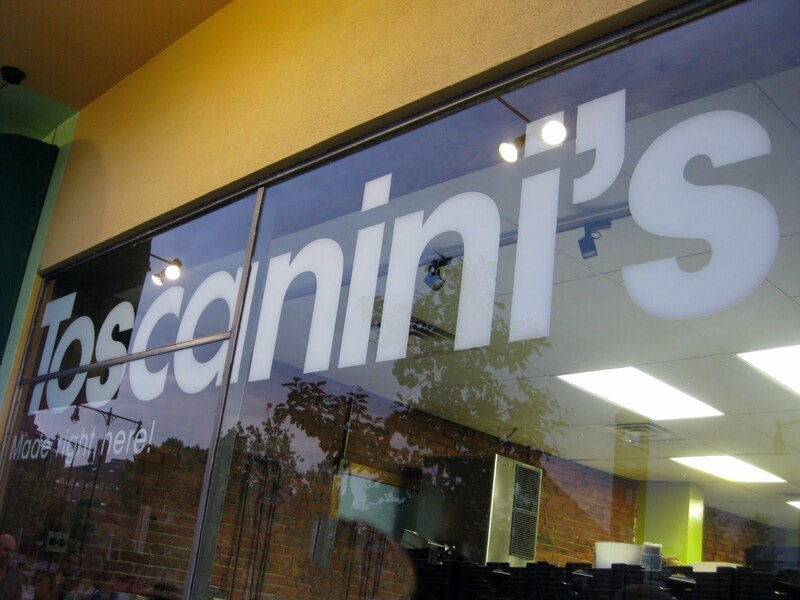 The New York Times said Toscanini's (which is in Cambridge, not Boston :) had the best ice cream in America and the shop isn't even in New York, so it had to be true, right? 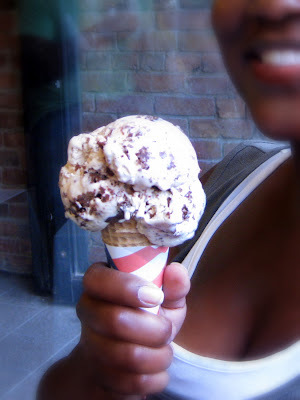 After tasting a sample, I settled on the B3 (Brown Sugar, Brown Butter, Brownie) ice cream. Oh man... this ice cream was so rich! The base was a buttery, thick ice cream that reminded me of toffee. There were huge chunks of brownie throughout that reminded me of my favorite brownie recipe. I could only handle on scoop of this deliciousness, but I enjoyed every single moment of it. This ice cream was worth every single calorie and all of the digestive discomfort. Now I'm convinced that I need to try to replicate it at home, since I doubt I'll be making it back up to Boston just for a scoop of ice cream. I've decided to dust off my trusty Cuisinart Ice Cream Maker (which I got for free for being such a loyal credit card customer years ago) and attempt to make a batch. I'm looking for a buttery base flavor sweetened with brown sugar and I'm planning to mix in some of my homemmade brownies. Stay tuned. I'm a bit concerned that the high fat content in the butter, eggs, and heavy cream may cause this homemade version to be an epic fail. Any suggestions? Anyone else out there like to make ice cream? If you haven't tried it yet, it's easier than you think... of course, that's another post. Man Oh man! I wish I knew they had good Ice Cream. All I heard was they were the birthplace for Dunkin Donut....but that ice cream looks yummy! Yes, yes, YES! You MUST try recreating that ice cream. Surprising? I think not. It's 3 B's! :) Btw, it should be blondies and not brownies. LOL! DO IT, Keeley! Yes, I will be bugging you regularly about it. I'm relentless! Ingrid, attempt #1 was made over the weekend. It wasn't sweet enough and it needed more brownie chunks, but the family and friends enjoyed it. If attempt #2 is good, it'll make it to the blog. Stay tuned! Oh, and 3Bs... funny! i know i'm going to sound crazy, but minus the brownies, that sounds really good. I'm not even really into ice cream that much, if anything I prefer gelatto. 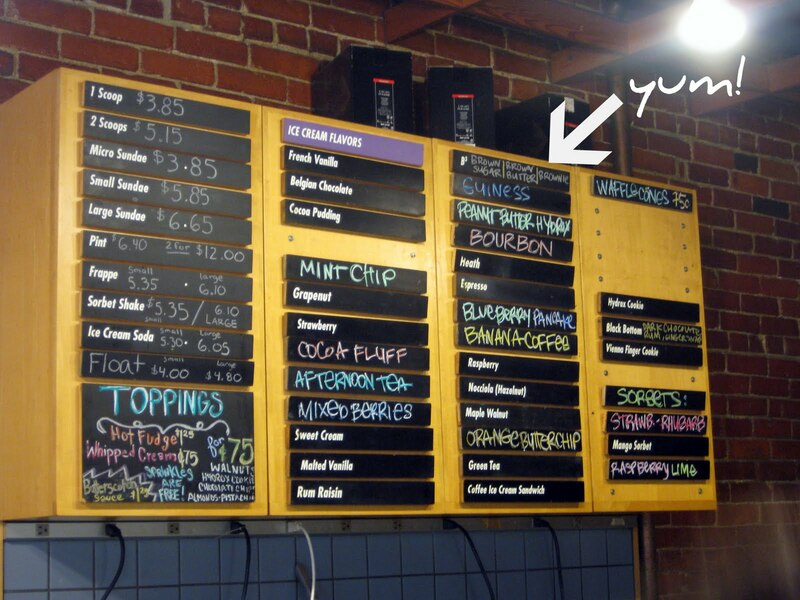 But if i'm ever in cambridge, I did notice that a bourbon flavor up on the wall, guess what i'm trying!